“It’s like an alcoholic”, said a colleague trying to shape his thoughts around this year’s Orange Marching Season. “The first step to recovery is admitting there’s a problem, and that's what’s missing”, he said. The restoration of the Good Friday Agreement and the decision of Ian Paisley to work with nationalists and republicans encouraged speculation that this year would witness a quiet Twelfth. And by previous years’ standards it was quiet. The political momentum had anticipated it, and on the ground, the hard work of republicans at the interfaces ensured a peaceful delivery. The Orange Order had attempted to move away from the sorry past of sectarian confrontation towards the establishment of the Twelfth as an Orange Fest, a cultural festival to celebrate Protestant identity, a tourist attraction of historic pageantry. Television coverage supported this portrayal of a family day out and the unionist media was full of smiling children in their bowlers and sashes and families watching colourful re-enactments of King Billy’s triumph astride his white horse, bewigged and resplendent in his red coat and dress sword. The Belfast Newsletter expressed the hope that the anniversary of the Battle of the Boyne will become an international tourist attraction. Its reporters interviewed George and Margo Sinclair from Pennsylvania and Su and Che Xing Ching, who had been unaware of the Orange festival before their arrival from Taiwan. International visitors interviewed by the Newsletter [all four], were thrilled by what they saw, said the editorial and the paper looked to a future when the Twelfth can be marketed throughout the world. It was left to the nationalist press to highlight some of the more negative aspects of Orangeism. For the Irish News it was the story of Peter Neil, a Catholic father who had been threatened by unionist paramilitaries after he took down a poster carrying his son Aaron’/s name from an Eleventh Night bonfire. 13-year-old Aaron Neil had died just two weeks earlier from heart disease. The bonfire also bore the name of another Catholic youth Paddy Brennan who died last year. It is traditional to ritually burn effigies on bonfires celebrating the Twelfth. Images of the Pope, nationalist politicians and republicans, as well as Catholic victims of unionist violence, are routinely burnt as part of the celebrations but that’s not an aspect of Orangeism discussed in the pages of the Newsletter or during the television coverage of the Twelfth. Peter Neil from Co. Derry noticed the banner bearing his son’s name erected on an Orange bonfire at Harpur’s Hill in Coleraine. A number of other banners bearing the dead teenager’s name were later discovered at a number of other bonfires in the area. Peter Neil notified the PSNI and requested that his son’s name be removed. The PSNI refused to intervene. “I didn’t want the banner burned and I didn’t want a couple of hundred people all standing around the bonfire cheering over my son’s death”, said Peter. Aaron was not political or sectarian and the only reason his name and circumstances were known was because his girlfriend had been a Protestant from the loyalist Windyhall area. Denied assistance by the PSNI, Peter decided to take matters into his own hands and removed the banner. Within hours known unionist paramilitaries were seen driving past his house and a short time later the PSNI arrived to warn Peter that his home was going to be attacked. On Tuesday night a crowd of unionist paramilitaries equipped with sledgehammers and ladders approached the Neil family’s first floor flat. 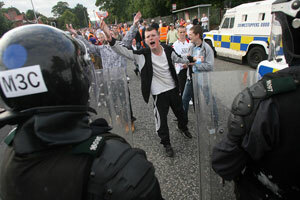 The PSNI held back the mob but made no arrests. Peter decided to evacuate his other children. “I have all sorts of barricades up against my door. I’ve put my children away into different, safe houses,” said Peter. Meanwhile a banner honouring sectarian killer Joe Bratty of the UDA was displayed during an Orange March in Belfast. Bratty organised the attack on Sean Graham’s bookmakers in the Ormeau Road in 1992. Five people were killed and many others injured when UDA gunmen opened fire. Amongst those killed was 18-year-old Peter Magee. His brother Patrick has demanded an apology from the Orange Order after a flag honouring the UDA killer was carried during the Twelfth celebrations. Unionist hopes to establish the Twelfth as an Orange festival and an annual tourist attraction for holidaymakers stands in stark contrast to the sectarian ethos that to date have been part and parcel of Orangeism. If the Orange Order wants to move away from all of that, well and good, but admitting there’s a problem is the first step towards recovery.